To see that in the project view you should use a customized one. In Application Descritpor check the "Custom template" check box and click "Create"
After that you'll find a new file myProject-app.xml in the procject view. Open that file and you'll find all setting options for the deployment. Search for <icon> and you'll find all tags for the different sizes of the icons prpared (still as commented text). 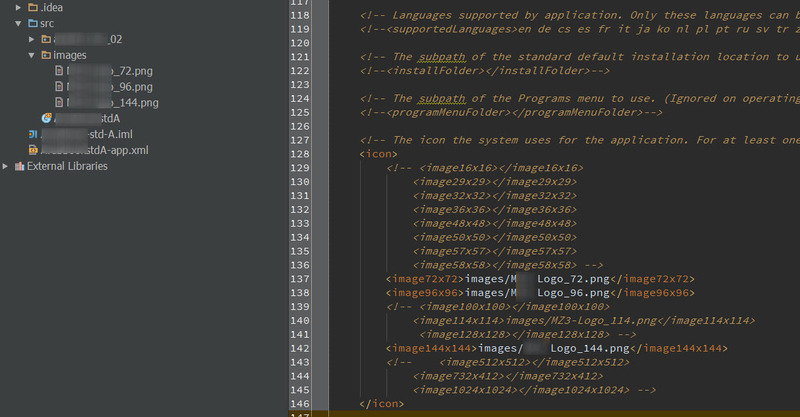 Uncomment those lines with the icon sizes you want to use and enter path and icon name; relative to your module. It must be PNG files of the correct size. With the next creation of the APK file you'll have your icons embedded. Hans gave the correct answer in general. 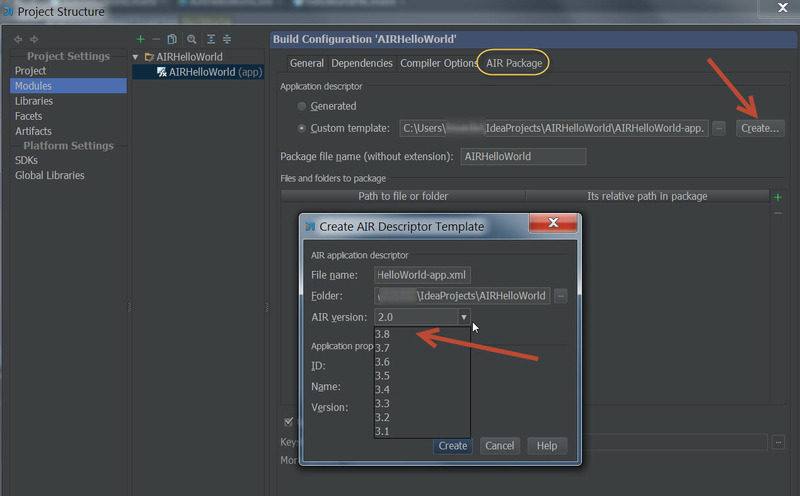 One correction - in case of mobile-targeted build configuration the tab will be named 'Android', not 'AIR Package'. Also I think you'll need icon files to be included in the resulting APK. Files to package are also configured at 'Android' tab. Thank you Hans and Alexander. I think that I understand, and will try to create an APK with custom icons, following your suggestions. If I have difficulty, I will write again. Oops, you are right; sorry. So far, followed all suggestions precisely, but no success. For AIR Android APK, using 3 icons as png's (36, 48 and 72-which are the usual sizes that I have used for Android APK icons in Flash CS6). Added these to a folder: images in the project. Went to the project's Android dialog and added these 3 icon png files to the package in the Android tab. Compile/Build, and the icons are not being used. Not sure how to fix? How do you check that icons are not being used? You need to install the app on the device, don't you? So either you create APK using Build | Package AIR Application and install the app maunally, or you start Flash app run configuration (Run | Edit Confgiurations...), that creates package and installs it on the device (and runs the app, so you need to exit it to check the icon). I don't know if it matters in this case but in general forward slashes are preferred. Path can start with images/ or be just icon36.png, just make sure that it matches 'relative path' in the table at Android tab. I had been manually installing on an Android device to test. The APK continued to display the default Android icon, not the new custom ones. I had realized that \ was probably needing to be changed to /, but this did not result in success getting the icon to display. I tried leaving off the images/, even placed my set of cutom icons directly in the app's root, made sure that the path in the XML matched the relative path in the dialog. So far, cannot get it to work. I will keep trying, testing on the device more. 4.10 and 3.8 work perfectly fine for me! Is the folder copied to the out/production/myProject/ folder? Is it included in the .apk package? You can test that in opening the apk file with e.g. 7Zip or Winzip. It should be located in the asstets/ folder. Thank you for your continued help. I must be doing something wrong. The icons are in the asset folder when I unzip the APK with 7Z. So they are getting there, but not displaying when I test by manually installing the APK on an Android device. I am placing the icons (all of them for either APK or Windows AIR: 16, 32, 36, 48, 72 and 128) in a project folder "icons." But, in the Android dialog, I am not sure if I should only add and reference the one "icons" folder or add/reference all 6 icon png files? Same problem with the XML: do I reference all 6 files in the correct locations? Maybe a coupe of jpeg's of your working set-up will help. I think my problem is not correctly referencing and matching between the XML, Android dialog/relative path and project tree location for the icons. Looks like you are pretty close! The second screenshot shows the project structure with the images folder as subfolder of src/; together with the <icon> definition in the respective application descriptor XML file. For my project I included the images/ folder in the list of "to be packaged files and folders". But you can select just the files you need and it will work also. The packaging process will tell you if a file that is defined in the application descriptor is missing. It also will throw an error if the file cannot be found. So if you do not see any error messages and find your files in the final apk file with z7ip, that process should work correctly. Try uninstalling your application on the Android device and deploy again. Instead of building and copying the app you also can set the run configuration to run it directly on your device. Then the app will be uploaded also and immediately opened. As Alexander said: close your app so you can see the icon. Double check if you did not install your app more than once on different screens; that's why I suggested to uninstall first to detect such mistakes. Success! Thank you very much.